We all have things on our Beauty to-do list which we never quite get round to doing…. but here are some of my top tips &tricks to feeling top to toe fabulous. 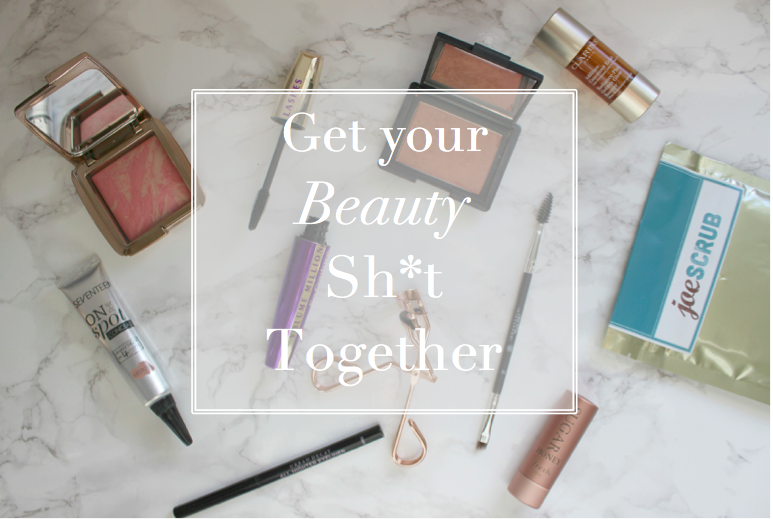 So, read on, and get your beauty sh*t together! When nothing will get rid of your under eye circles, you’ve just got to fake it. Reach for a brightening blush to detract from dark circles, (for your cheeks, don’t apply under your eyes!) one with shimmering particles will do the trick. My favourites include the Hourglass Ambient Lighting Blush and also NARS blush in Gilda. When your eyeliner fades as soon as you leave the house, you should try switching up to a gel liner. They usually last longer and give a more intense effect. I’m currently loving Urban Decay’s Ink for Eyes for its easy application. When you’ve forgotten your mascara, you can smudge black pencil in the roots of your lashes to create the illusion of fuller lashes. Use a soft but intense black, like Urban Decay’s All Nighter. When your brows are growing out, but not quite ready to be tackled by a professional, you can still tweeze under the brow. You shouldn’t try touching the shape, but you can create a neater effect by using a light brow palette like the Paul & Joe brow palette which I reviewed here. Wash your hair with lukewarm water and make sure your whole head is wet. This helps to ensure an even spread of shampoo. You only need a small amount of shampoo. Think of a size between a 5p and 10p coin, thats how small. Suddenly those expensive haircare products are lasting waaaaay longer! Squeeze shampoo into your hands, rather than onto your head. You’ll ensure a far more thorough cleanse and evenly distributed product. Remove excess water before applying conditioner, so that your hair soaks up a higher concentration of the conditioner, and not just water. Never, I repeat never but it on your scalp (unless you like flat, heavy hair!). Prep skin properly! Gentle exfoliate from head to toe to get an even tan. I am currently loving the Joe Scrub coffee scrub, which can be used to slough dead skin cells, as well as combat cellulite, acne and scars. Next, add a layer of moisturiser to areas where tan can build up, like wrists, knees and elbows. Start tanning at the bottom. I always begin with my lower legs, and build up toward my thighs. Any excess on my mitt is tapped onto my feel and then i’ll work down my arms and worse. Always use a baby wipe to cleanse between fingers, palms, and the soles of your feet. My favourite allover tan is the Express Tanning Mist from Sienna X. Then make it last! By showering in lukewarm water, you’ll extend your glow. Also avoid over scrubbing skin, and avoid steam rooms and moisturising every day. What are your tips for getting your Beauty Sh*t Together? Next Post Topshop Jewellery Haul!